If you’re looking for a new favorite vegetable, look no further than beets! Beets are earthy, but also pack a lot of sweetness. Did you know they are one of the few vegetables you can completely consume? That includes the roots, stems, and leaves. 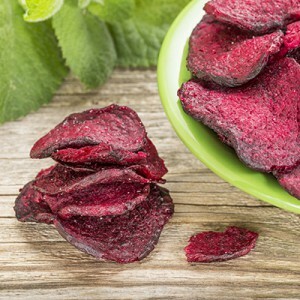 For every cup of cooked beets, you’re getting 15 percent of your daily fiber needs, 15 percent of your daily potassium needs and 10 percent of your daily magnesium needs, all while also getting an excellent source of folate. Folate is wonderful because it’s what your body uses to produce and maintain healthy cells. Beets are not only delicious, they’re easy to incorporate into your recipes as well. Are you ready to try some beets? Here are some great recipes to get you started! 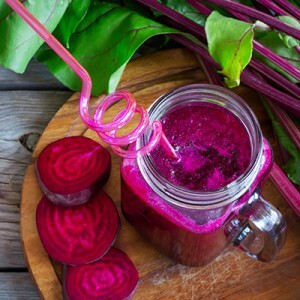 Kickstart your morning with a beet and berry smoothie! If you want a pro tip for making this smoothie, add half a cup of low-fat yogurt for some added taste and creamy texture. You can also dice and freeze your cooked beets ahead of time for a chilled smoothie. Add 3/4 cups of ice, then place all of the ingredients in a blender and puree until smooth. Enjoy! These chips taste similar to roasted corn and have a sweet flavor, which makes them perfect to eat as a snack on their own. Thinly slice your beets. Your slices should curl somewhat when sliced. Split the slices between two baking sheets and slightly drizzle with olive oil. Add a small amount of salt and pepper, then toss to cover the slices. Make sure the slices aren’t touching when placed on the pan. Bake 15 to 20 minutes or until crispy and slightly brown. Remove from oven. Let cool. Enjoy! If you enjoy eating hummus, you’ll love this Roasted Beet Hummus recipe! Roasting brings out the natural sweetness in vegetables and intensifies their delicious flavors. This cooking method will caramelize the exterior and keep them moist and tender on the inside. 1 teaspoon dried thyme leaves, this is optional! Preheat your oven to 425 degrees F and line a baking sheet with parchment paper. Toss the beets, olive oil and thyme in a bowl until beets are coated, and arrange the slices on baking sheet so that they don’t touch. Sprinkle with sea salt. Roast until the beets are tender, 10 to 20 minutes. You can test them by inserting a fork into a slice. If completely cooked, the fork should pierce it easily. 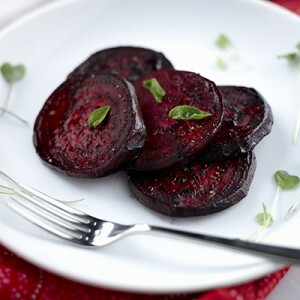 What are your favorite beet recipes? We’d love to hear about them. Share your favorites with us on Facebook, Twitter and Instagram!